• JDL is engaged in Indian ethnic and fashion wears for women. • It markets various products in its own nine brands. • The sudden spurt in the bottom line for FY18 raises concern. • The issue appears fully priced on current performance parameters. • Currently, the textile segment is not fancied by investors. Jinaam's Dress Ltd. (JDL) is one of the manufacturers of Indian ethnic and fusion wear for women. It designs, manufactures and markets a wide portfolio of women's apparels across multiple brands. The company sells its products through own distribution network spread across 19 states and 4 union territories in India. It operates a retail store for women's apparel located at The Gateway Hotel, Surat, Gujarat. JDL also has an exclusive tie-up with e-commerce platform www.manndola.com, owned by one of its Group Company, for online marketing and selling of our products. 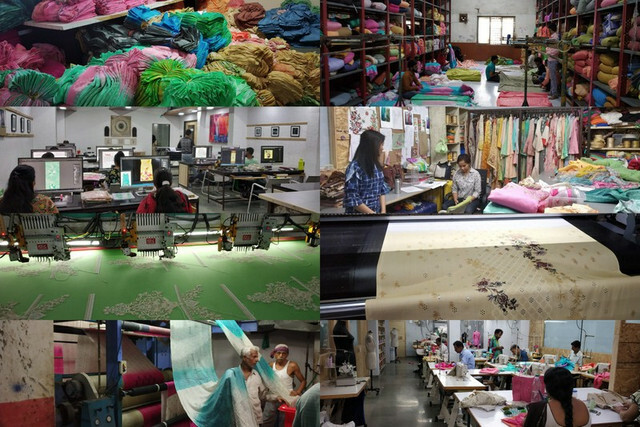 JDL has an installed manufacturing capacity of 500000 meters/month for dress materials. Its manufacturing process starts with the processing of procured grey fabrics such as dying, printing, embroidery, cutting, stitching, sewing, finishing, inspection and packing of the final products. The company offers a wide range of Indian ethnic and fusion wear for woman which includes 'lehenga-choli', 'kurti', 'dupatta', scarfs and 'sarees' of various fabrics such as satin, georgette, crepe, chiffon, velvet, polyester, cotton, silk, wool etc. that caters to adding variety of the wardrobe requirements of the Indian woman, including every-day wear, casual wear, work wear, evening wear, party wear and occasion-wear at various price range. Over the years JDL has developed own brands based on its understanding of target consumers. Its current brand portfolio includes "JINAAM'. ", "FLORAL CREATION", "ROMA", "ASMIRA", "HEROINE", "BAHNI", "ZAREEN", "TIARAA" and "FORMM". Each brand is catering to different sets of consumer requirements. "Roma" is a brand catering to the women ethnic market in cotton and crepe fabric with high-end embroidery and skilled stitching techniques. "Heroine" is the premium clothing brand. It focuses on developing and introducing new designs at regular intervals based on an understanding of the current market trends. During FY 2017-18 it has introduced around 134 product catalogues each of which comprises an average of around 8-10 designs. JDL's distribution channel currently covers states of Gujarat, Punjab, Delhi, Haryana, Jammu & Kashmir, Maharashtra, Karnataka, West Bengal, Madhya Pradesh, Kerala, Telangana and Uttar Pradesh. It also caters international market in countries such as United Kingdom, Dubai, Nepal, Pakistan, Afghanistan and Mauritius directly or through merchant exporters and bulk fabric dealers. To part finance its plans to purchase of machineries (Rs. 7 cr. ), working capital (Rs. 18 cr. ), repayment of certain debts (Rs. 5 cr. ) and general corpus fund (Rs. 8.8 cr.) needs, OHRL is coming out with a maiden IPO of 7200000 equity shares of Rs. 10 each at a fixed price of Rs. 59 per share to mobilize Rs. 42.48 cr. The issue opens for subscription on 09.04.19 and will close on 15.04.19. Minimum application is to be made for 2000 shares and in multiples thereon thereafter. Post allotment, shares will be listed on BSE SME. Issue constitutes 32.31% of the post issue paid up capital of the company. The issue is solely lead managed by SMC Capitals Ltd. while Bigshare Services Pvt. Ltd. is the registrar to the issue. NNM Securities Pvt. Ltd. is acting as a market maker to this issue. Having issued initial equity at par, JDL raised further equity in the price range of Rs. 18 and Rs. 70 between March 2015 and February 2019. It has also issued bonus shares in the ratio of 4 for 10 in February 2018. The average cost of acquisition of shares by the promoters is Rs. 4.19, Rs. 9.79 and Rs. 12.29 per share. Post issue JDL's current paid up equity capital of Rs. 15.08 cr. will stand enhanced to Rs. 22.28 cr. On the financial performance front, for the last three fiscals, JDL has posted turnover/net profits of Rs. 136.49 cr. / Rs. 2.14 cr. (FY16), Rs. 135.02 cr. / Rs. 2.88 cr. (FY17) and Rs. 154.25 cr. / Rs. 7.82 cr. (FY18). For the first eight months ended on 30.11.18 of the current FY19, it has earned a net profit of Rs. 4.17 cr. on a turnover of Rs. 95.24 cr. The sudden spurt in the bottom line for FY18 (ahead of IPO) raises concern. For the last three fiscals, JDL has posted an average EPS of Rs. 3.52 and an average RoNW of 18.62%. The issue is priced at a P/BV of 2.14 on the basis of its NAV of Rs. 27.60 as on 30.11.18, and at a P/BV of 1.55 based on post issue NAV of Rs. 38.17. Its current debt-equity ratio of 1.44 (as on February 2019) will stand reduced to 0.72 post issue. If we annualize JDL's latest earnings and attribute it on fully diluted y post issue equity, then asking price is at a P/E of around 21 making it fully priced offer. Based on FY18 earnings issue is priced at a P/E of around 17. As per offer documents it has shown TCNS as its listed peers, that is currently trading at a P/E of around 42 (as on 04.04.19). TCNS is working on an asset-light model with third-party sourcing of materials while JDL is having an in-house design and development process. Thus it cannot be strictly compared with each other. On merchant banker's front, this is the 1st mandate from it's stable and has no track records. However, it is worthwhile to note that SMC Capital is acting as a market maker for Kranti Industries Ltd. The sudden spurt in bottom lines forFY18 raises concern. The company did placement of shares at Rs. 70 per share with a group of investors ahead of IPO. Based on valuation parameters, the issue appears fully priced. However, JDL is working on an in-house process module that might lead to better margins going forward. Currently, the textile segment is not favoured by investors for investments. Considering all these, investors may consider an investment for the long term. The Jinaam's Dress Limited IPO Analysis helps you to understand about the company, offer detail, valuation, capital structure and financial performance. Our SEBI registered IPO Analysts tells you if Jinaam's Dress Limited IPO worth investing. The Jinaam's Dress Limited IPO Note sets the IPO expectations in systematic way which tells you if Jinaam's Dress Limited IPO good to buy (good or bad / yes or no). The IPO Forecast tells you weather to invest in Jinaam's Dress Limited IPO by providing IPO recommendations i.e. subscribe, avoid and neutral.